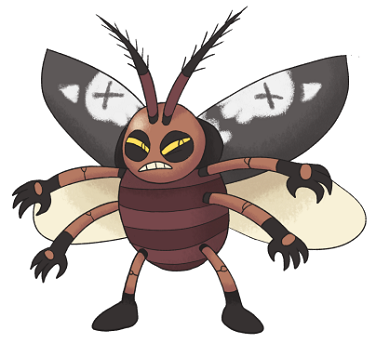 Enkroach is a Bug/Dark Pokémon. It evolves from Kroach at level 25. This hardy Pokémon lives in abandoned buildings and city streets. It distrusts all humans and hisses at anything that walks by its territory. Enkroach prefers squalid conditions that few other Pokémon could stand. It makes its nest in condemned buildings and hoards food. Enroach is based on a cockroach and a street punk, with markings suggesting a skull on its elytra, as well as glove markings on its hands and 'eyeliner' around its eyes.